Looking for a fun and different weekend activity to do with your kids? Take them out on a 'Coaster Crawl.' The San Diego Coaster isn't just for commuters. It is also an ideal form of transportation to take the family on a day trip, especially on a busy summer weekend. Leave your familiar neighborhood park behind and explore San Diego in a way both kids and adults will have fun with. The San Diego Coaster is a train that travels along the coast of San Diego County from downtown San Diego up to Oceanside and all stops—with the exception of the Santa Fe Depot—have free parking lots. The Coaster runs in both directions and kids will enjoy the excitement of riding on a train plus the ocean views outside the window. Get off at just one Coaster stop or explore the area around several of them during your day. Santa Fe Depot Station - Take the kids to Seaport Village by the harbor, which is only a 10 to 12-minute walk from the Santa Fe Depot stop located in downtown San Diego. Ride the carousel and then watch the local artists as they draw and paint portraits and scenery. Children will also delight in the street performers that are often found entertaining in Seaport Village. Old Town Station - The Old Town Coaster stop is within an easy walking distance of Old Town's many historic sites. Children will especially enjoy visiting the Mason School House, a one-room schoolhouse still set up with desks and school objects from the 1800s. Sorrento Valley Station - Many of you may be starting your Coaster crawl at the Sorrento Valley station. If you're not, skip getting off at this stop as it's mostly an industrial area with office buildings. Solana Beach Station - This is an excellent Coaster stop to grab a bite to eat, as the family-friendly Pizza Port is located right across the 101 Highway from the Solana Beach station. The picnic-style benches inside are ideal for a rambunctious family and mom and dad can enjoy one of Pizza Port's award-winning microbrews while the kids check out the video games at the back of the restaurant. Encinitas Station - Did you know there's a botanical garden in Encinitas? The San Diego Botanic Garden is located on the south end of Encinitas in close proximity to the ocean. Take the family for a stroll through the garden and learn about its various plants and flowers. Kids will also love the Hamilton's Children Garden, a garden just for them, which has a tree house they can explore. Carlsbad Poinsettia Station - Does one of your kids need new shoes or pants? Use this station to access the Carlsbad Premium Outlets mall for a day of shopping. It takes about a half an hour to walk from Carlsbad Poinsettia station to the Carlsbad Outlet Mall or is just a short cab ride. In spring, the Carlsbad Poinsettia stop is also an ideal gateway to get to the Carlsbad Flower Fields, which are adjacent to the outlet mall. Carlsbad Village Station - This coaster stop drops you right in the middle of Carlsbad's downtown area, affectionately called the Village by local residents. The Village has its own Pizza Port and many other great places to eat. For families with small children, we recommend Boxd, a take-out eatery serving waffle sandwiches, located at the corner of Carlsbad Village Drive and State Street. Boxd looks like a food truck, but is actually an old shipping container and has a large grassy area on which to eat and relax. If your children need more room to run around, take them to the beach. The Carlsbad Village station is just a few blocks away from Carlsbad's clean beaches and the waves at the end of Grand Avenue are ideal for boogie boarding. Oceanside Transit Center - Go for a walk along the Oceanside Pier and grab an old-fashioned milkshake at Ruby's Diner on the end of the pier. The Coaster crosses three different zones: Santa Fe Depot and Old Town are one zone, Sorrento Valley is its own zone and all other stops are in the third zone. 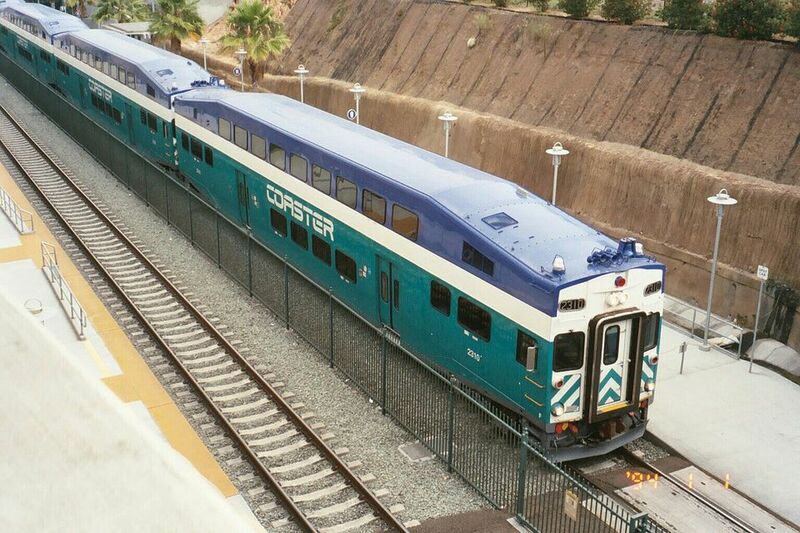 Travel from Santa Fe Depot to Oceanside or vice versa takes one hour. Trains leave from each station multiple times throughout the day and vary by day. Check the Coaster schedule to figure out which time will work best for your family to start its Coaster crawl. Buy tickets at the station before boarding and keep them handy—attendants will come through and check that you have a ticket once onboard.